This area has, much like Shoreditch, become a popular and trendy place to live in the last 20 years. However, this has been a different evolution to that experienced by Shoreditch itself. With major redevelopment almost impossible due to the social structure of the area, Hoxton has had its own evolution. Popular with all those who love the surrounding areas of Shoreditch, Spitalfields, Brick Lane and Islington and with London Fields and Victoria Park nearby, Hoxton property offers a far more affordable alternative- whether buying or renting. The area offers a variety of property types with plenty of apartments and flats to rent in Hoxton. This part of London has its own vibe and movement but offers those that live there easy access to the further delights on offer in Shoreditch, Brick Lane, Spitalfields and Islington. The Regents Canal is a popular thoroughfare for pedestrians and cyclists alike providing scenic and direct access either up in to the heart of Islington or out through East London taking in both Victoria Park and Millennium Park. Hoxton still retains a lot of Local Authority and Council Housing. Only small pockets have been redeveloped to create bona-fide upmarket areas like Hoxton Square. Many privately owned ex-local authority properties and flats are very popular on the local rental market. They offer above average size accommodation at entry-level prices (for the area) and many are just a few minutes' walk from the local entertainments and arts. Whilst there have been unique developments popping up across the area, such as Lanesborough Court on Fanshaw Street, an area-wide redevelopment is not possible. An excellent example of redevelopment, however, is the award winning Timber Yard on Drysdale Street, N1 designed by Sir Terence Conran, which features modern flats with loft style industrial resin floors, high specification kitchen and high ceilings. Another award winning development is the stunning Chocolate Studios on Shepherdess Place, a converted Victorian Chocolate Factory that includes 14 residential apartments. Hoxton is probably the most diverse of local areas when it comes to residential property and local accommodation. With unavoidable stark contrasts between the high end market developments and swathes of Council Estates It is often an area that divides people- you either love it or you hate it! We, needless to say, love it and our extensive knowledge of the area makes us one of Hoxton's best estate and letting agents. The first recording of "Hogesdon" is in the Doomsday Book. The word originally means Anglo-Saxon farm or "fortified enclosure" belonging to Hoch/Hocq. There is little else on record, though there was Roman activity around Ermine Street, which ran to the east of the area from the 1st century. Hoxton formed a rural part of Shoreditch parish in medieval times. In 1826, Hoxton was awarded independent ecclesiastical with the founding of its own parish church dedicated to St John the Baptist situated on Pitfield Street and better known today as St Johns Hoxton. However, civil jurisdiction remained with the Shoreditch vestry. In Tudor times the open fields to the north and west were used for archery practice and, on 22 September 1598, the playwright Ben Jonson fought and killed actor Gabriel Spencer in a fatal duel in Hoxton Fields. Jonson was able to claim benefit of clergy by proving his literacy to escape hanging. Hoxton also contained public gardens that were a popular resort from the crowded city streets on holidays. They apparently gained their name of Pimlico at the time from the publican, Ben Pimlico, and his particular brew. The gardens were located near Hoxton Street, which was known at the time as Pimlico Path. The modern area of Pimlico derives its name from its former use in Hoxton. On 26 October 1605, Hoxton achieved notoriety by strong links to the 'Gunpowder Plot'. Whilst most of the conspirators fled on the discovery of the 'Gunpowder Plot' Francis Tresham, a local resident, was arrested a few days later at his house in Hoxton. A commemorative plaque is attached to modern flats on the site of Parker's house in Hoxton Street. By the late 17th Century, many of the existing large houses were used as mad houses with almshouses being built on the land between by City benefactors and guilds. Askes Almshouses were built on Pitfield Street in 1689. Hoxton House, for example, became a private asylum in 1695 and expanded rapidly into the surrounding streets and quickly became known as the Hoxton madhouse. Here fee-paying 'gentle and middle class' people took their exercise in the extensive grounds between Pitfield Street and Kingsland Road. Around 1921 Hoxton Square and Charles Square were laid out, forming a fashionable area. In Hoxton Street, a plaque marks the location of the Britannia Theatre. This 3,000-seat theatre evolved from the former Pimlico tea gardens, a tavern and a saloon. Sadly the Britannia Theatre, along with the nearby Pollock's Toy Museum, were destroyed in Second World War bombing. Hoxton Hall, which is still a thriving community centre to this day, began life in 1863 as a 'saloon style' music hall. There was also the 1870 Varieties Music Hall in nearby Pitfield Street. This became a cinema in 1910 but closed in 1941. Since 2003 the site has remained empty, but in 2008 it was gutted and prepared for redevelopment. Local opposition to the design has resulted in the project being put on hold, so it now remains empty and "For Sale". Gainsborough Studios were located in a former power station, in Poole Street, by the Regents Canal. Gainsborough Studios was famous for work filmed there by Alfred Hitchcock, Ivor Novello, Gracie Fields and Michael Balcon. The film studios operated here from 1924 to 1951. A historical plaque is attached to the building, now a modern residential development. Manufacturing developments meant that many of the small industries that characterised the area moved out. By the early 1980s, these industrial lofts and buildings came to be occupied by young artists as inexpensive live/work spaces, while exhibitions, raves and clubs occupied former office and retail space at the beginning of the 1990s. By the end of the 20th century, the southern half of Hoxton had become a vibrant arts and entertainment district boasting a large number of bars, nightclubs, restaurants, and art galleries. 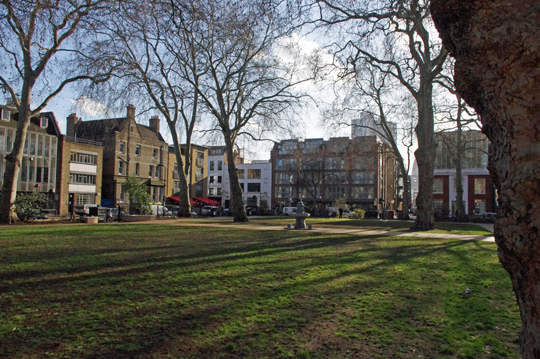 This fashionable area is centred on Hoxton Square, a small park bordered mainly by former industrial buildings as well as the elegant St John's Hoxton. Hoxton and Shoreditch are often deliberately or unwittingly confused. The two districts have a historical link. As part of the same manor, both formed part of the Metropolitan Borough of Shoreditch. This later became the London Borough of Hackney in 1965, but old street signs bearing the name can still be found.